Our custom made blinds, designed, manufactured and installed by us will exceed your expectations. Blinds are measured and installed by the same person and with 12 years experience we will assist you in making the right choices when designing and finishing off your outdoor area. Whether it is to keep the sun out, rain and wind out, or to provide privacy, blinds are an excellent choice, practical and aesthetically pleasing. 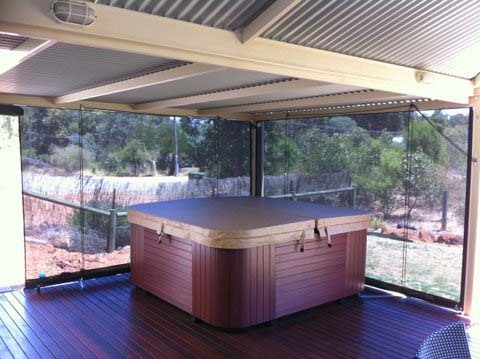 We can also provide shade solutions for your caravan and boat. Cafe blinds can not only transform your outdoor living space but make this area of your home more usable and a more pleasant place to relax. Our professionalism, exceptional service, and prompt instillation are what we pride ourselves on. We service all areas and specialise in the domestic and residential market. We are very proud to provide a 2 years workmanship warranty. Why shade view, mesh blinds? Shade mesh blinds are becoming very popular. They are excellent at keeping the sun, wind and rain out with UV rating of up to 90 percent. Very little maintenance has them looking good for years, the mesh has a 5 year durability warranty. The durable mesh comes in a large range of colours to suit your needs. Mesh has the added benefit of providing privacy, while allowing views to be seen clearly from the inside. Some Outdoor areas require clear or tinted PVC blinds. They provide protection from the wind, rain and keep the cold out in winter. Our blinds are made to fit and provide excellent barriers in you outdoor area. We use quality products and we are happy to discuss your particular requirements. The new innovation in outdoor blinds are Ziptrack blinds. Specially designed track on both sides of the blind enable the fabric to glide smoothly and easily (stopping anywhere you want) Ziptrack blinds can be secured and locked in any position no zipper no buckles required, simple. Contact us by phone or e-mail for any extra information or advice.